The area encompassed by the Gravois-Jefferson Historic Neighborhoods Plan includes a diverse group of residents, businesses and community institutions. 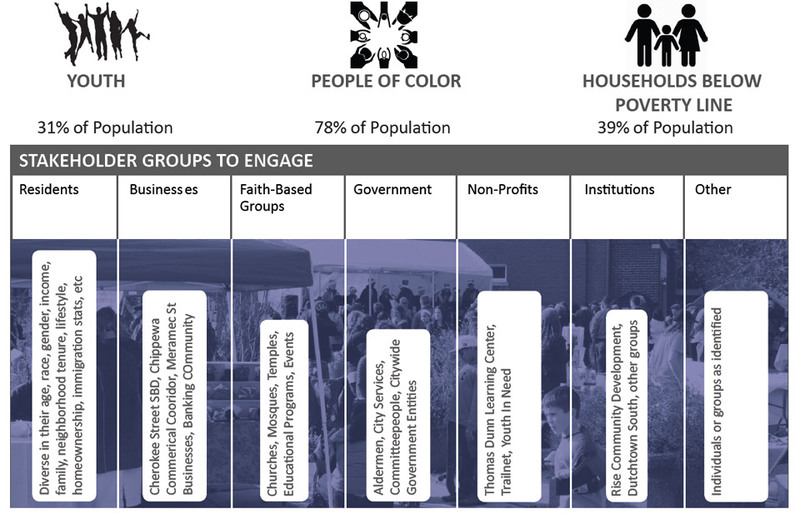 Throughout this process, we seek to engage this diverse group in developing a shared vision for our neighborhoods. The Benton Park West, Gravois Park and Northeast section of the Dutchtown neighborhoods have approximately 13,000 residents, diverse in age, race and socio-economic status. These neighborhoods are seeing increased civic engagement and the planning process will enhance communication and coordination. Local civic organizations, churches, schools and local businesses will be engaged by Dutchtown South Community Corporation and its partners to not only engage residents in the planning process, but also to build their power and ability to steward the Gravois-Jefferson Plan into the future. By adopting an “Asset Based Community Development” approach, we intend to support resident participation in, and ownership of, plan development. Missed the Public Kickoff Meeting? You can still participate in the activities and have your voice heard here!